Normally, price Ondesoft Audio Recorder full serial license key is $29.95. On the Ondesoft thanksgiving giveaway, you can obtain Ondesoft Audio Recorder with free license key. This audio recorder work & available for Mac OS only. It’s a powerful audio recorder for MAC OS. The tool can record audio from any source on Mac. 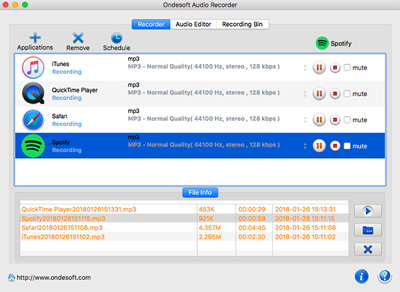 Ondesoft Audio Recorder is easy-to-use Mac application. The software can record voice directly from microphone and other sound being played by other applications. Other features on this Mac audio recorder tool is audio extractor. With apps, you can extract audio from YouTube, Facebook videos, and Vimeo. Ondesoft Audio Recorder can save the recorded audio as MP3, WAVE, AC3, OGG, ACC, and other various audio formats. The free license offer is available on the Thanksgiving giveaway. The free full version of Ondesoft Audio Recorder is available on the following link. Giveaway page Ondesoft Audio Recorder: Thanksgiving Giveaway Page. To grab a free copy of Ondesoft Audio Recorder with free serial license key please visit the Thanksgiving Giveaway Page above. Fill up the online form by entering your name and valid email. Then click on “Get Free Code”. You’ll receive the serial license code of Ondesoft Mac Audio Recorder in your email inbox. The giveaway software us the latest version. The installer this audio converter software can be download here: Download the installer. After giveaway expires, you can grab the license with 50% discount. There two valid 50% off discount offer for Ondesoft Audio Recorder. Buy Ondesoft Audio Recorder w/ 50% Discount: Click here to buy! This Mac audio recording tool can record from internal application or external source (microphone, line-in, etc). It also features with time schedule to start & stop the recording process.